The Columbia Fire Department was joined by multiple neighboring departments in battling an apartment complex fire at 205 Agnew Street off Bottom Avenue early Monday night. Flames were showing from the roof upon firefighter arrival shortly after 5:30 p.m. Norman Taylor, owner of Sunderman’s Garage at 717 Bottom Avenue, said he could see the fire from his nearby repair shop. The Waterloo, Millstadt, Dupo, Prairie du Pont and Camp Jackson fire departments assisted with equipment and manpower, Columbia EMS, Columbia police and the Monroe County Sheriff’s Department also responded to the scene. Columbia Fire Chief Mike Roediger said the fire originated in the lower right apartment unit, Room No. 2. The male occupant of that unit, Tim Toenjes, was in another room when he heard a pop and went to the living room to see his couch on fire. The flames quickly spread to the curtains, prompting Toenjes to exit the unit. Toenjes went to an area hospital for treatment of smoke inhalation, Roediger said, but his condition was not immediately known. A family member told fire officials later that he sustained second degree burns in his shoulder area but is otherwise OK.
Roediger said the cause of the fire appears to be a candle that was burning next to the couch. The glass containing the candle apparently cracked, leading to the fire. “That’s why I do not like candles,” Roediger said. 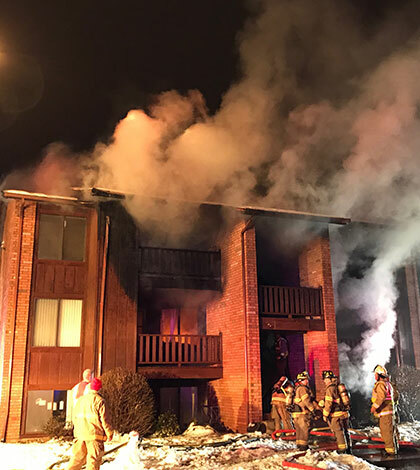 There were several more occupants inside the six-unit apartment complex when the fire broke out, Roediger said, and they were all able to escape without injury. “Police did a great job of evacuating everyone right away and making sure everyone was accounted for, so we could concentrate on knocking down the fire,” Roediger said. While the lower right unit appears to be a total loss, the other five units of the complex sustained smoke and heat damage but still have belongings that are salvageable, Roediger said. Fortunately, all affected residents of the complex have relatives to stay with for the time being. Firefighters cleared the scene shortly after 9 p.m.